On the way back to San Miguel from my visit to La Gruta and Atotonilco, local expert Pablo and I stopped at La Fabrica Aurora, an old textile mill that has been turned into a stunning art and design centre. From 1902 to 1991 La Aurora was a leading textile factory that received its electricity from the “Las Colonias” Dam. Since its closure, this historic complex has been converted into artists’ studios, galleries, unique home décor and design stores as well as three restaurants. Special events and art classes also take place at La Aurora, making it a highly sought-after destination in San Miguel de Allende. 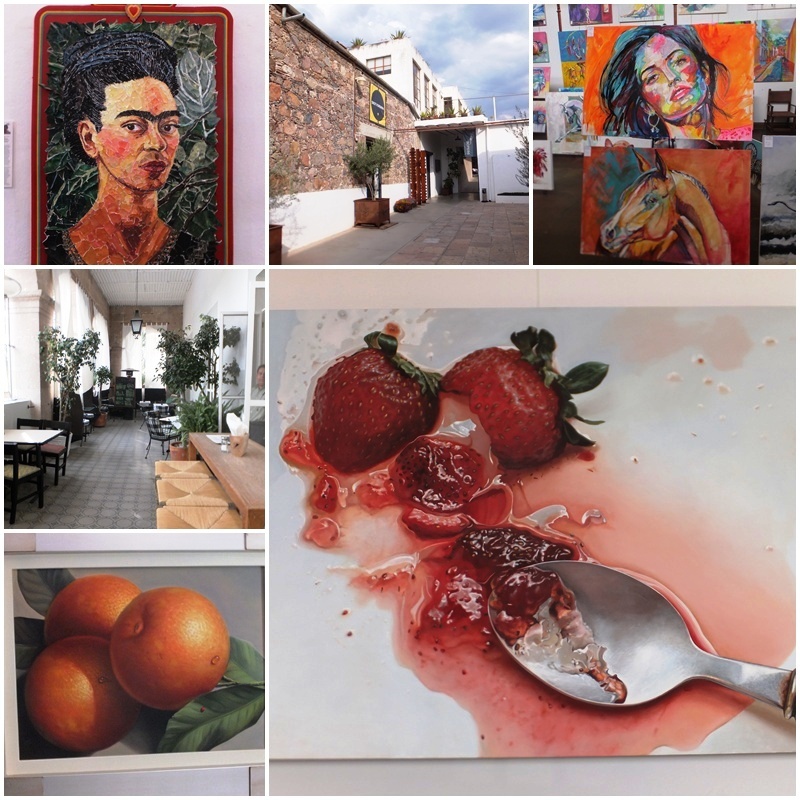 By the way, the strawberries and spoon that you see in the main photo were not part of a dessert I ate but they are a gorgeous, giant hyper-realistic painting on canvas that is for sale at La Fabrica Aurora. It was already evening when I arrived back in downtown San Miguel again. 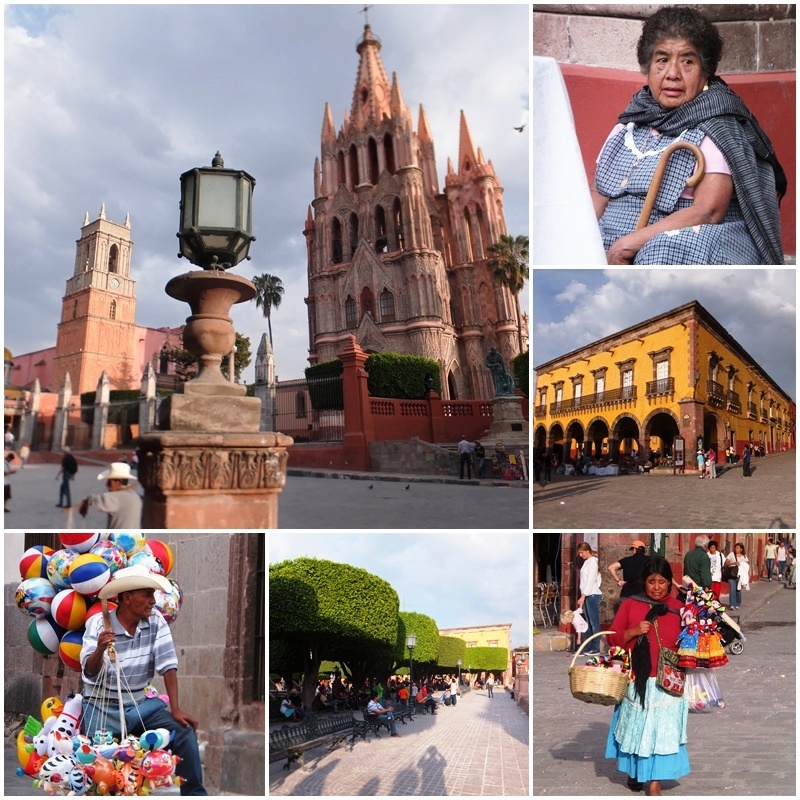 One of my favourite spots is, of course, the main square of San Miguel de Allende. The main landmark is without a doubt “La Parroquia de San Miguel Arcángel”, one of the most photographed churches in all of Mexico. Its Neo-Gothic façade was constructed in 1880 and replaced the original exterior that was built in the 1600s with a traditional Mexican façade. Next to La Parroquia is the Church of San Rafael that was founded in 1742 by Father Luis Felipe Neri de Alfaro and features a Moorish-style bell tower. Both of these churches are located on the south side of “El Jardin” (“the Garden”), the cobble-stoned main square of San Miguel de Allende. It is the centre of the community where people gather and relax on benches underneath the laurel trees, listening to the mariachi bands and taking in the lively ambience at any time of day or evening. 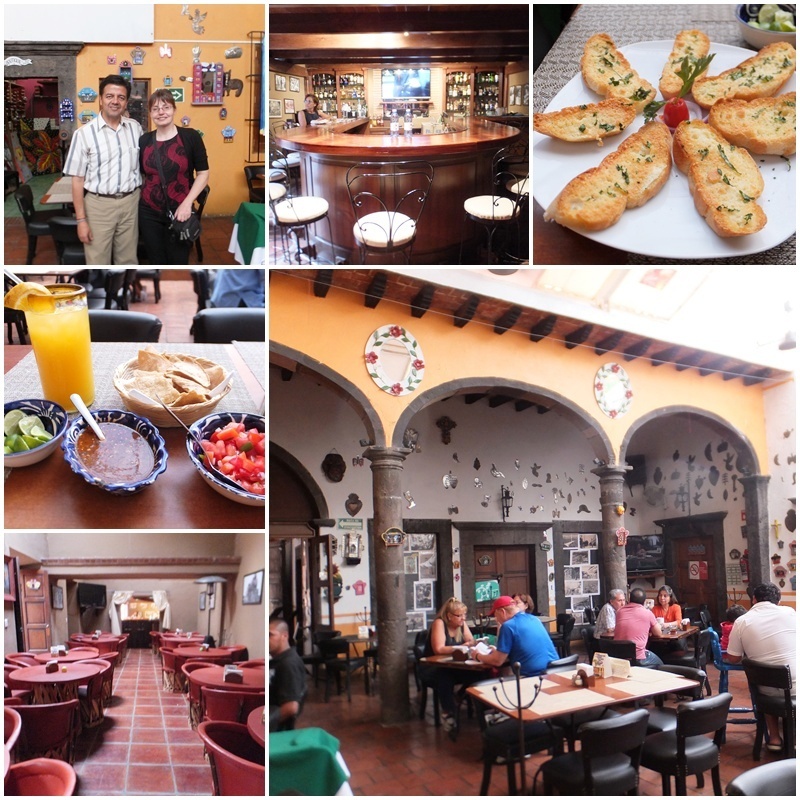 For my evening meal I visited Los Milagros Restaurant which is located on Calle Relox, just around the corner from main square of San Miguel de Allende. The restaurant is located in a historic colonial mansion and features a full bar that is popular for its tequilas, margueritas, mojitos, martinis and piña coladas. Dining takes place on the atmospheric patio around a fountain or inside an intimate salon. Live music featuring salsa, cumbia and trova entertains the guests every night from Monday to Saturday. For dinner at Los Milagros Restaurant I started with a delicious house salad with lettuce, heart of palms, Chihuahua cheese, olives, onions and tomatoes followed by the day’s special: succulent quail with fresh local vegetables and baked potato. I ended the meal with one of my favourites: strawberries with chocolate. 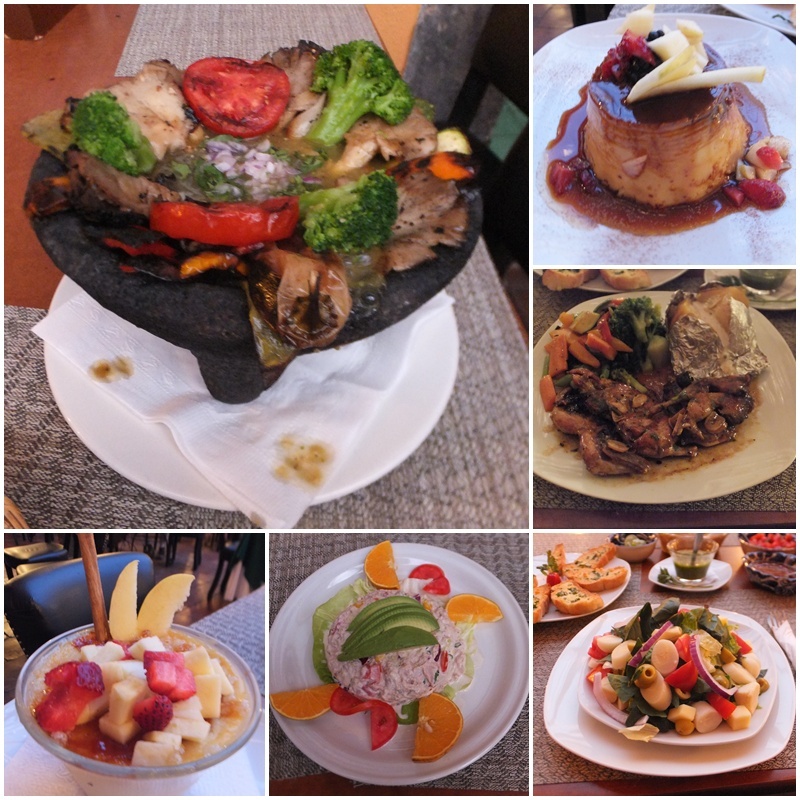 Several other guests invited me to take pictures of their food including some of the sizzling signature dishes called “molcajetes”. These sizzling hot plates feature Arrachera beef, chicken, shrimp, fish or beef / chicken fajitas. As part of traditional Mexican cuisine, these dishes are created inside a piping hot stone tool shaped like a mortar and pestle that is heated over an open fire. An authentic Mexican dinner provided a fitting end to a day full of traditional Mexican experiences.